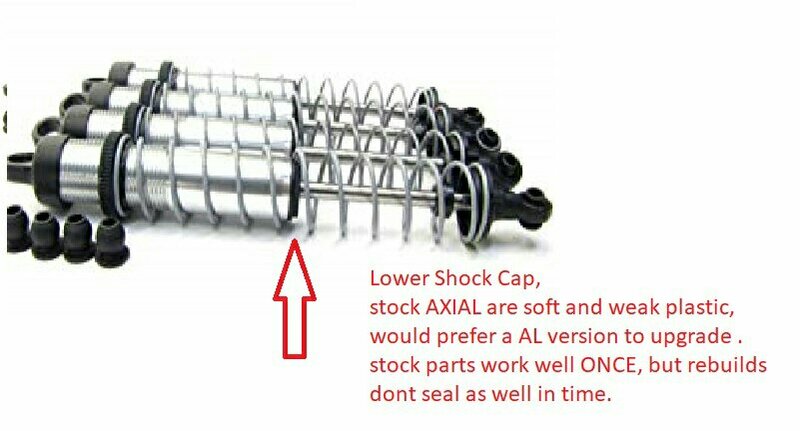 AXIAL lower shock caps. the stock ones are bad. One made from AL that threads together, instead of snap?? got a unrelated question for ya. picture for shock part, not sure if its possible. if you do consider it, a PTFE insert would be the bee's knees to perfect shocks. 2.6 beadlocks for the J Concepts tires. Heck Id pre-order and pay today. AL -hard anodized beadlock if possible, somthing TOUGH!!! It seems as if most of the rim/wheel choices for the 2.6 jconcepts are SOFT. they dont take much abuse. aftermarket beadlocks could fix this. heck, if the offset was enough, we wouldnt even need adaptors!! 1.55 wheels should be made already..
Hello! I would love to see a dig unit for a bomber style trans because you know... dig is awesome. Im sure there is an adapter for the wraith or scx10 style trans to run on a bomber skidplate. Or a wraith skidplate swap. Not worth making a dig kit for a different trans. 2.6 is irrelevant to 1.55. This! Tiny tires are gaining massive ground and it's about time VP makes a scale 1.55.
this seems like a failure of 3-part. not sure where small wheels came into play but ok.
i doubt any company will make such large wheels, but it was worth the try. No doubt RC/hobbists would buy scale items, (smaller wheels/tires) and its nothing new about monster truck guys having to make/create what they need.